Our travels were touched with some sadness this year as our dear dog Fudge died very suddenly and unexpectedly just before Christmas. So we were back to three canine companions, Fudge leaving a big gap in our family. But the French sun shone continuously and we experienced several heatwaves. Lots of thunderstorms this year too which made for many nights without much sleep due to our big (but scaredycat) male dog being reduced to a trembling, drooling mess as the thunder crashed around us. We always seem to gravitate towards the mountains and stayed for several weeks very close to the Italian border. Turns out that the Italians seem to love our greyhounds as much as the French. We even met an Italian couple who had just adopted an Irish greyhound. We just seem to have such wonderful travels around France and we continue to be made to feel so welcome (but not everywhere – see below!). We have made some great friends along the way too. But don’t forget that although your dog doesn’t need tick treatment now he/she does still need to visit a vet between 1 and 5 days before your departure back to the UK for tapeworm treatment and the appropriate pages of the pet passport signed, dated and stamped. You will not be allowed back into the UK otherwise. People do still make mistakes. When we arrived at Pet Control at Eurotunnel for our return to the UK, a gentleman was completely perplexed when he was told he didn’t have the correct paperwork – he hadn’t visited a vet in France for the tapeworm treatment, believing that he’d done enough by giving his dog some worming tablets himself before they’d left the UK 2 weeks before. So, once again we say …. be sure you know what is required before you travel. By the way, if you are a keen hiker and are planning on doing long walks with your dog, do some research before making a long journey to a particular area. The regional parks in France have nature reserves within them. These reserves can be massive and can form a large part of the park. Often this can be within the mountains and these reserves ban dogs completely. The nature reserves are often above the ski lift height but can be closer to accessible road links. It can make long distance hikes along GR routes impossible with your dog. For example, in the Parc des Ecrins at the Col du Lauteret, I walked past a pictorial sign at the roadside which I thought asked for dogs to be kept on leads. Twenty minutes later I found myself being shouted at by a very aggressive farmer because the sign had actually said that dogs were banned completely. He was very angry with me and I was caught completely off guard because I just hadn’t expected for dogs to be completely banned from an area the size (and beauty and popularity) of the Lake District. Additionally, be aware that even in normal countryside your dog may be banned from any field which has cattle in even if the public footpath runs through that field. Bit of a pain when you’re following a walking route! Follow this linkfor an interesting article on this subject France is very different to the UK in terms of countryside access with your dog – farming takes precedence. Great stuff! Thinking of holidaying in he uk with our dog. We live in…….. Singapore! Rules sound the same… I wonder? Singapore appears to be on the approved list of countries for entry into the UK under the scheme so …. sounds good! She came out from uk, was pretty worried about the plane trip but she was totally relaxed when she arrived. Still… Seems like a bit of a mission for the poor girl. Still thinking on it, hate to leave her behind! Loved following your travels..my daughter lives in France so next summer i will be taking my dog Boo, we always go camping in the south while out there but wondered about beaches Boo (a border collie) loves the beach are the beaches dog friendly? That depends. In some places we have seen that dogs are banned from the main beach area but are allowed on the beach further away from that point. However, we have just returned from Northern Brittany and found that on almost every beach we came to that dogs are banned ALL YEAR. Locals told us that this is a new thing and that they ignore the ban in the winter but the signs are clearly there and it is a worrying trend. We’ve also heard from people living in the Marseille area that the south of France is difficult for dogs due to comprehensive beach bans in the summer. Taking our 4 dogs to france hopefully this April May for 6 weeks…. just looking a campsites…. getting passports for dogs in Feb… feel very apprehensive at taking them (wont go without them) just want them to be safe and enjoy experience (2 labs 2 terriers) always camp with us here in england. What about camp sites and doggy exercise areas?? also picking up poo??? have they got bins ??? Some campsites will restrict the number of dogs per pitch but you may not find this too much of a problem in low season. Poop can just be put in normal bins with other refuse. Campsites, in our experience, don’t have specific exercise areas for dogs as they sometimes do here. But …. relax …. you’ll have a great time! -what will we do when we want to go somewhere that he cant go ie shopping, for a meal, to the park with our toddler? Will it be too hot in the motorhome for him to stay in there? – will he be allowed on the beach in european countries? – we are planning to just let our noses lead us and we are not booking sites, will this be a prob as aug is peak season and with the addition of the dog &the child will we have a prob finding sites? Re leaving the dog in your van, I guess you need to use your common sense. Putting up your blinds on all the windows will help keep the van cooler but you would still want to avoid leaving him in the van in the hottest part of the day. We’ve been to some very hot parts of France and we only leave the dogs in the van first thing in the morning and only then for very short spells. 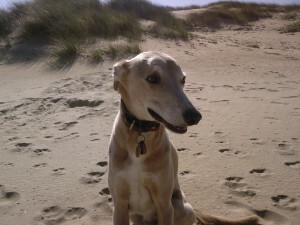 Re beaches being dog friendly, it’s similar to the UK …. hit and miss (see our page ‘Is France dog friendly?’). Re not pre booking, we never book but we also tend to avoid the coasts. The large coastal commercial sites with facilities may well be full, or even not accept dogs during peak season. Smaller sites and municipal sites would be better (and cheaper) bets but you may well find any coastal area as crazy busy in August as you would expect. Things get quieter after 14th August when most French return to work. Off the beaten track and you’d have no problems at all. Go for it …. honestly it’s great and you’ll have a terrific time! I have just stumbled across your brilliant blog. 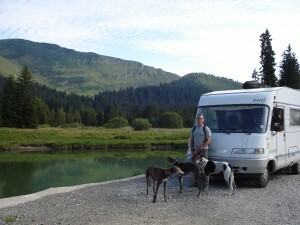 We have just added out fourth dog to our “pack” and travel to the French Alps every August to race with our dogs. I have just been informed by my vets that some travellers have fallen foul of the French ruling on the Rabies vaccination. Whilst the vaccine is licensed for 3 years in the UK, France ask for an annual booster. Have you heard of this or come across it recently? I am reluctant to over vaccinate our dogs if we don’t need to, but similarly my vets mentioned of dogs being seized if they are involved in any altercations and do not have an annual booster, so serious stuff. As an aside we came across restrictions for dogs in National Parks whilst in Val d’isere last summer, when checking with the tourist office for walking routes with dogs, they suggested the high street….! Great blog though, with fabulous advice. I’ve never heard of any problems arising from this. We know our French vet very well now too and she has never hinted of it being a problem. It is the law in France (and most other mainland European countries) for resident dogs to receive an annual rabies vacc. This has nothing to do with the Pet Passport requirement which is set by the UK for (re)entry into the UK. You would only be affected by the French annual vacc requirement if your dogs became resident in France ie you decided to live there because your dogs would then fall under French law (I believe that dogs are considered to be resident after 3 months). I had some experience of the rabies situation on a trip a couple of weeks ago to Languedoc. The French vet told me that for complete rabies protection you should have annual vaccination as the protection tails off but that legally for return to UK the 3 year vaccination is acceptable. I checked with my UK vet who, not having seen rabies first hand, said he thought 3 years WOULD give protection. I am not so sure, the French/Spanish do have experience with rabies and presumably would have knowledge of best protection in their own country. I know in Val d’Isere certain dogs are allowed up Olympique bubble in summer, but only wearing a muzzle, I don’t think they are allowed to romp around! Hi – we have heard a similar account. Our vet told us we would probably need annual vaccinations against rabies for travelling to France. Tate has just had his vaccine so is fine to travel this year (he has had it before) but our vet suggests getting it done before travelling each year… It would be very interesting to hear of others’ experiences? We intend to spend the summer at our place n France…..over 60 days by quite a chunk. No insurance company anywhere seems to cover our dogs abroad over 60 days. AXA offer three x 60 days cover in a year, but the cost to bring them back and forth would be prohibitive. As any competant Insurance company would check the pet passport, to get out of any contract, I am well and truly snookered……Any suggestions folks? A really helpful blog which answers lots of questions for would-be itinerant dog owners – thanks very much. Just to add to the info about dogs in National Parks in France, we found the same difficulty in Ireland, that the National walking trails often banned dogs completely. And it was not that evident on the maps we downloaded before we left. Check the general smallprint on websites before you assume you can take your dog. Hi guys! We’re taking Mouse, our husky-ish cross to the south of France in July and this site’s been amazingly useful in planning for her travels. We did some fantastic walks from Valloire (good walking leaflet from the tourist office and it’s a terrific little town with a great campsite). Also good walking from Annecy. The Vosges and the Jura are very good for walking and quieter than the Alps. In the Southern Alps we tend to drift towards the ski resorts which are set up for summer walking but which are usually still below the nature reserve restricted areas. Not sure if they have campsites for tents though so may not suit you. Hope you have a good time! My wife and I are taking our bichon to fancy next month. He has his vacations and passport. The only question I have is, does he have to be in a cage within France, or can he just lie on his bed on the backseat? See this link You’ll need a French dictionary but I think it quotes a law which says you need to make sure that all passengers in your car are restrained and do not present an obstruction to your driving/vision. But the author says that the law does not clearly refer to animals but also warns that fines do apply. So, to be sure, he recommends at least securing your dog to a seat belt to restrict movement. On a slightly different note, does anyone know if P&O ferries require a pet fit for travel stamp on their passport on the return to Britain? I am having my puppy vaccinated against rabies on the 3rd of August, and I want to take our him to France on 7th August, and plan to return on the 27th August. I have tried HARD to get a definitive answer regarding the 21 day rule.. The DEFRA site only refers to bringing pets into the UK needing the rabies vaccine 21 days prior to entry, when I rang them they told me I needed to have the vaccine 21 days before I left the UK, but could not, when asked back up the statement with any info on the website. The leaflet, Vaccinate Now, issued to vets by Virbac, a rabies vacine manufacturer says that the 21 day period is only needed to return to the UK. Apparently it is an EU law that all dogs have the rabies vaccine when travelling between member countries, BUT there does not appear to be any sort of control at borders, other than when entering the UK. I have travelled extensively around the EU and the only place I have seen PET travel offices is at the French Borders,and inward at Dover. I have not seen any offices at Dover outbound, and a friend tells me they do not have to take their dog into one at the Channel Tunnel either. My vet believes that we will be fine as he issued Pet Passports to dogs at the same time as the Rabies vaccine is given, and not heard of any problems leaving the UK. So my question is, can I go to the EU from the UK without being stopped at Dover? There seem to be no checks going out of the UK but you are technically breaking the law in France. Your choice! Hello there.. what a wonderful site.. well done and sorry to hear about fudge leaving you last year. we are travelling to south spain via euro tunnel through to france then driving down to the south coast of spain in a couple of days and have taken all the necessary precautions re collars etc.. however..by chance I stumbled on a website that said that certain breeds of dogs are not allowed in france. ie mastiffs. we have are baby greggy. he is a four year old ridgeback cross boerbael we think, although he could be ridgeback x Labrador as he is not very big but does have buid of Labrador features of ridgeback x boerbael.. his passport says ridgeback x boerbael as that is what we thought at the time. does anybody know if this will present a problem in france.. please help..